Director Leo McCarey paired with actor Cary Grant only three times over 20 years, with 1957’s An Affair to Remember as their most famous collaboration. This occasional partnership began with a 1937 romantic comedy called The Awful Truth. After years of marriage, Jerry Warriner (Grant) suspects wife Lucy (Irene Dunne) of infidelity – and vice versa. This lands them in court for a bitter divorce. As the legal end date of their marriage nears, they find new partners. Each one resents the other’s fresh start and they actively try to sabotage these nascent romances. Gee, you don’t suppose that Jerry and Lucy will reconcile before their divorce becomes final, do you? Sorry for the sarcasm – and hinted spoiler – but Truth comes with a completely predictable plot-line, one that probably seemed easy to anticipate even when the movie was new 80-plus years ago. With a movie like this, the journey matters more than the destination, and in that regard, Truth does pretty well for itself, though I wouldn’t say it excels, as others in its genre fare better. Heck, I can find two superior efforts with Grant alone, as His Girl Friday and The Philadelphia Story both easily top Truth. Still, none of this makes Truth a bad film, and it offers a reasonable amount of entertainment. Grant creates a lot of the mirth, as he creates a very typical “Cary Grant character” but does so with enough aplomb to charm. Dunne seems less delightful as Lucy, but she’s still fine in the role. While she may not compare favorably with actors like Katharine Hepburn or Rosalind Russell, she carries her part in a positive way. All of this leads to a good romantic comedy that offers a likable 91 minutes. It’s an enjoyable affair that falls short of “classic” status. The Awful Truth appears in an aspect ratio of approximately 1.37:1 on this Blu-ray Disc. Though it looked fine for its age, the image didn’t dazzle. Apparently the master of Truth couldn’t be found, so the Blu-ray came from a mix of other sources, and the distance from the first generation became an issue mainly due to one factor: grain. While I’m happy the Blu-ray didn’t slather on digital noise reduction, the prints left awfully heavy grain that almost certainly wouldn’t have been an issue if the film enjoyed a lower generation source. The nature of the print in use led to less than consistent sharpness as well. Though much of the movie showed pretty good delineation, fine detail went lacking, a factor exacerbated by the grain as well. I wasn’t displeased by definition, but I thought the image lacked great clarity. Blacks managed to become fairly deep and dense, while low-light shots offered largely appealing presence. Like almost everything else, contrast took a hit due to all the grain, but the film still mustered a reasonably nice silvery sheen. Print flaws didn’t impact the presentation, so it seemed clean. While I appreciate the effort put into the transfer and attempts to make the film look as good as possible, the nature of the source left this as a “C+” image. I felt more pleased with the film’s PCM monaural soundtrack, as it held up well over the last eight decades. Dialogue was distinct and relatively natural, and I noted no signs of edginess or problems related to intelligibility. Effects appeared crisp and acceptably realistic, with no distortion or problems. The movie featured almost no score. A few brief snippets of music appeared on a couple of occasions but these were so minor that they might as well have been non-existent. During those short periods, however, the music sounded fine and displayed no concerns. You won’t be dazzled by the audio of Awful Truth, but it held up nicely for an 81-year-old mix. When we go to extras, we find a video essay called Tell Me Lies About Cary Grant. It runs 15 minutes, 59 seconds and presents notes from critic David Cairns. He looks at aspects of the careers of actor Cary Grant and director Leo McCarey prior to Awful Truth and goes over how the film impacted both men. Cairns provides some useful notes, especially as he details the evolution of the “Cary Grant Character”. Next comes an Interview with Critic Gary Giddins. In this 24-minute, two-second chat, he discusses the work of McCarey as well as aspects of the creation of Truth. Giddins brings a nice overview of topics connected to the film. One semi-major quibble: Giddins claims the Truth won the Oscar for Best Picture. This is incorrect, as The Life of Emile Zola took home the prize for 1937. Leo McCarey did win Best Director, though. A 1978 Audio Interview with Actor Irene Dunne fills six minutes, 52 seconds. Dunne covers aspects of her experiences on Truth. We find a short but engaging chat. 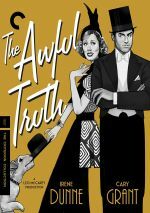 The disc ends with a September 11, 1939 Lux Radio Theatre Broadcast of Awful Truth. 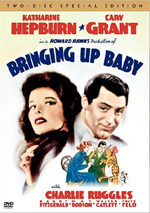 It lasts 59 minutes, 39 seconds as it brings Cary Grant back to reprise his lead role and pairs him with Claudette Colbert in place of Irene Dunne. Most radio adaptations sacrifice a lot of movie material, but given the relative brevity of Truth, this version manages to keep most of it intact. It also benefits from a potential upgrade in acting, as I prefer Colbert’s take on Lucy to Dunne’s. The radio version works better than usual. Like all Criterion releases, this one includes a booklet. It features an essay from critic Molly Haskell. The booklet finishes the package on a satisfactory note. A mostly engaging comedy, The Awful Truth doesn’t live up to the heights of classic films. Still, it benefits from appealing actors and becomes a reasonably likable effort. The Blu-ray offers acceptable picture and audio along with a decent selection of supplements. I’ve seen better romantic comedies, but this one entertains most of the time.